1. Gather supplies. I used burlap for the fabric, since I like the look of it, and I had a bunch of it in my fabric stash. 2. 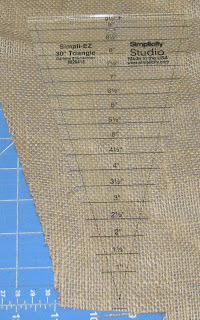 Cut the triangles, or whatever shape you want your fabric pieces to be. I found this triangle ruler at Joann Fabrics in the quilting section. It was on clearance for $3.97 and was the perfect size for my banner. 3. I used this stencil by Hillman Sign Center to pain my letters onto the fabric. I bought this stencil set at Lowes, in the mailbox section. They did have some at the local craft stores, but they were a bit more expensive. These letters are 4 inches tall. I used a round sponge brush to blot the paint on, and I used DecoArt Dazzling Metallics Elegant Finish Paint in Rich Espresso. They didn't have fabric paint in the color that I was looking for, but this all purpose acrylic paint worked just fine. (If I planned on washing my banner, I would have gotten fabric paint, though). 4. Once everything had been painted, I let it dry for 24 hours. 5. Attach the triangles to a string of some sort. I used double fold bias tape. I simply slide my triangles in between the two pieces or bias tape and pinned them in place. I set everything up on a flat surface so that I could make sure that my placement was good and my spacing was correct before I pinned everything in place. Then, I used two rows of zigzag stitching to secure it. 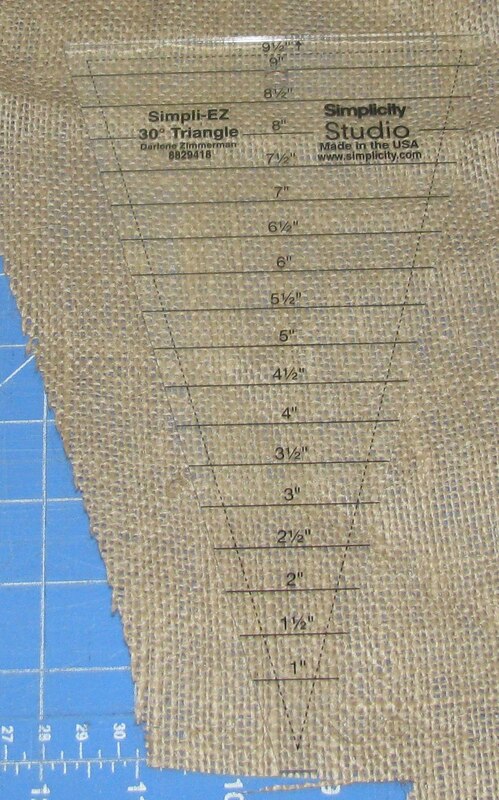 Since burlap tends to unravel, I thought that two rows of stitching (one at the top and one towards the bottom of the bias tape) would make everything more secure.